Ha! I bet that got your attention. This is one of the coolest footstools I have ever seen. This was a footstool down at the Wadena Historical Museum. They have a really nice Museum and they are open year round, so I will head over there again sometime next winter. I was tempted to turn it over and look at the bottom. I know better than to touch! I try to enforce the “Look but do not touch” policy..and I know how hard it is not to touch..especially for children. This is an old family photo. We are not sure exactly who it is. We think it might be Great Uncle Herman. I wish we knew for sure who it was. It is a marvelous old photo. Update: Cousin Tom is fairly certain it is Great Uncle Herman. Where: This photo was taken at the Headwaters of the Mississippi River up in Itasca State Park. Why: Because it is traditional that someone take photos of you when you walk across the rocks. When: Well preferably when there is no snow or ice. When was this photo taken..I will guess sometime in the 1940’s or early 1950’s in August. Yes, August..the weed beds are very similar..so I think August. This is a photo that I took of my husband and a very good friend Sue. She was thrilled to be able to walk over the Headwaters of the Mississippi in August of 2008. No not the fireworks kind of Rockets but the one called Hesperis matronalis..a non-native wildflower. We found a patch growing near an old farmstead. Old farmsteads in Minnesota usually have some Lilacs and sometimes Dame’s Rockets. This was a good year for Dame’s Rockets..cool and rainy. We planted some rockets at our place..they lasted a couple of years..then they died out. Perhaps a bird ate our seed and pooped (ahem.. deposited) them at this nearby farmstead. The evening light really lit up the flowers. They almost seem to be glowing. The Lilacs are still there, they were done blooming. The Lilacs give way to the Dame’s Rockets..both with spectacular flowers. I was happy that it was on a Sunday so that we could all go! Chance stayed with Miney and Little Elvis..I am sure he serenaded the entire neighborhood while we were gone. The recital was held at the Fairgrounds during the Greater Grand Forks North Dakota Fair. They had a great set up, with the music instructor and a few other musicians. They played along with the students. Noah did great and we are very proud of him! Especially since this time he played his new to him guitar that he had saved up for all year. Well I have almost eight weeks down..the time I spend at the museum goes quite fast. We are seeing a influx of tourists especially on rainy days. They are tired of entertaining their kids in a cabin..so they all come to the museum. My daughter Jen made a Military display in the cabinet in the foyer for me. She is very talented! She has a “eye” for putting things together and they all look great. She edited most of the letters that I had to write..thank you for the donation..thank you for renewing your membership..yada yada..she made me sound real good. I know more than I did when I first started. I am learning. I am learning that Rome was not built in a day and the museum will keep on being the museum day after day. I hate the meetings, they take up so much time and effort. I have to be pleasant and I have to know “stuff” and I will be the last one there to clean up the kitchen and to lock up the doors..on one of my days off. It is the day off part that sets me on edge..if it is one of my days off..then let me have the day off..gosh sometimes I really need those two days off to get my smile pasted back on my face again. Sometimes I get tired off smiling, sometimes I get tired of talking..I just want to hide in a vault and wait for someone to drag me out. I am getting some more volunteers ..slowly. On Friday I drug a small table up from the basement and set it just outside my office. I placed a chair nearby and moved the bell and the sign. The one that says “Ring the bell if no one is at the desk.” The volunteer on duty has to have someplace to hang out near the foyer and greet people as they enter the building. We have sleigh bells on the door, but if I am in one of the back rooms or in the basement I have no idea who is in the building. The other day I was giving a tour and I could hear the sleigh bells ringing and the phone was ringing off the hook..people were coming and going..I am just one person. Just a little ways north of us is a lake called Bad Medicine. We drove up there one evening to scout out the public landing just incase Jen and Andy want to explore that lake someday. The landing is great, and Chance found the water very much to his liking! I have not been on this lake in years. My Uncle Adolf and Aunt Lila took me fishing and for my first boat ride on this lake a long, long time ago. Bad Medicine..are you wondering how it got it’s name? Me too..I looked it up. The Native Americans thought that a lake with no inlet and no outlet was a bad sign, they would not fish in the lake or hunt nearby. The lake is spring fed, it is about 4 miles long and a half a mile wide..it covers about 750 acres. It is fairly deep, it’s deepest point is 87 feet deep. It is also called Lake of the Valley. It is summer now, we have had summer for three whole days..and it has rained and rained. Finally yesterday afternoon we saw the sun. That has been our weather pattern, it rains for three or four days or the wind howls like a banshee and then we have one nice day which is usually windy. So far it is a non summer. The flowers bloom anyway. The Blue Flag Iris are blooming. We found this one close by. This is a Wild Iris/Blue Flag Iris being choked out by Leafy Spurge..it does make for a pretty photograph..but also a sad one. Far Guys Wild Iris/Blue Flag Iris are beautiful. He planted these from seed a number of years ago. Last year he had one bloom and I missed taking a photo of it. This year he has two blooms and two buds..success. His patience and persistence has paid off. Far Guy and I were in town on Monday, one day before summer arrived along with the cool weather and the rain. Far Guy wanted me to take a few photos so he pulled over into the Casey’s parking lot. Just as we pulled in a Gull flew out of the dumpster with a doughnut. I wonder how often he comes here for breakfast? He ate the whole thing. Years ago you never saw the gulls, we just didn’t have any. Then the French Fry Plant came to town and with it came the Gulls and if the wind is from the right direction the smell of half cooked french fries fills the air. I took the photo Far Guy wanted. The Memorial Day tornado and accompanying high winds totally changed the landscape across from the house he grew up in. First a Casey’s next door and then the road was widened and a sidewalk added..and now the storm damage at the forestry across the street has changed a once familiar area. I guess I used to pick my Mother’s flowers. She took a picture to prove it. My Mom took this photo and she wrote “Pickin my flowers again.” Apparently I was a repeat offender. It also looks like I might have a dirty face in this photo. This was more than likely taken during the summer of 1954..I would have been almost three years old. Mom picked one of the lousiest places for a flower bed..the earth was hard there and hardly grew grass. She moved the flower bed eventually..near the outhouse..flowers grew really good over there. My Mom still grows flowers that I would like to pick. This is one of my favorites from her garden last week. I did get just a few photos of the Yellow Lady’s Slippers on the back driveway. This year there are seven blooms. Ten years ago we had three blooms. You have to be patient! The seventh is there but very hard to see off to the left of slipper number five. If there weren’t located in a sea of Poison Ivy I would have gotten closer. I already have one spot of miserable ivy on my hand ..I suppose from my friend Chance. These Yellow Slippers along the back drive are very shaded by the trees to the west of the drive, if they were in a sunny location they would bloom earlier. The ones located in the gardens just west of these are all done blooming and have been for many weeks. It was Fathers Day, so the Showy Lady’s Slipper that are the Minnesota State Flower are beginning to bloom. They will bloom about two weeks, give or take, depending on wind, the rain and the temperatures. I got a heads up from Phyllis a faithful blog reader and friend and from my cousin Geraldine. We found these blooming in a ditch about eight miles south of us. One of these evenings we will head out to see how the rare white ones did this year. Last year they were deer food before they even opened. I am keeping my fingers and toes crossed that the deer have not found them this year. These Lady’s Slippers are part of the Orchid Family and are native to Minnesota throughout the entire state except for the southwestern part of the state..it must be too rocky there. They like wet swamps and moist woods that get some sun. It is a very slow growing plant and from seed to bloom can take 15 to 20 years. I give my Dad money for Bingo every year for Father’s Day. Sometimes I go along with him to Bingo. My Dad likes Bingo, he plays on Tuesday and Thursday nights. My Mother stays home and sews in her sewing room. My Dad picks up Darrel for Bingo. Darrel is legally blind. Darrel has his own Bingo Cards with the little red windows that cover up the numbers that are also in Braille. Darrel's fingers fly all over his bingo cards as he plays three cards at once..and pays just like everyone else. Just think of the money he saves on bingo daubers. Darrel and Dad enter the Eagles or the Legion with Darrel holding onto Dad arm. They walk slowly to their seats..I heard last week that SOMEONE was sitting in their seats. Interlopers..that did not realize that Darrel and Dad like to sit in the same spot every week because that is the spot where they can hear the bingo caller call out the numbers the best. I think perhaps they should have assigned seats! My Dad is in the center, he is joined by his sister, my Aunt Anna and his son, my brother Jody. My favorite Antique Shop is closing. The place where I could wander around for hours in the winter. The place where I stopped to buy old photos. She has had it. She is finished with the antique business. I went to school with Linda. From first grade through graduation from high school. I like all Linda’s signs. I suppose she has taken them all down by now. I would walk around snapping pictures of all her signs..she would just smile and say “Knock yourself out.” She is closing “for good” June 20. She told me that she is becoming a waitress for her son who opened a new restaurant someplace over by Duluth. So she is moving and taking a new direction in her life..I wonder when she turns 60? Perhaps she already did. Today at work the lost was found. One of the things that has been holding me back is keys. Keys that unlock padlocks and glass cabinets..keys that have been missing for well over a year. Keys that no one knew anything about. Lots of keys…a whole box full of keys. The other thing that has been missing has been the old index card files filled with records of everything in the museum. My Knight in shining armor came to the rescue again! Far Guy emailed the former director of the museum. She told him where the keys should be. I looked, I am not real tall and the ceilings are ten feet tall and I could not see the top of a cabinet. I did not want to crawl up on a chair..but one of the Board Members did and low and behold the keys and the cards were found. They are now safely on a shelf in my office. I took the plunge and started entering items in the Past Perfect Museum Program. I should have had at least a week of training..instead I have been reading the manual during lunch. Today I invited a Board Member over to see what I was doing and to make sure that he has an inkling of what was going on. Items are being entered with numbers and with accompanying photographs and thank you letters are being sent. I have a volunteer!!!!! I am pleased as punch..she is perfect!!!! I have known her for years..and we have the same weird sense of humor. She volunteered all last summer at the museum. She loves people and she loves history and she loves to talk..my kind of gal! Dare I wish for one or two more just like her?? Chance did a great job posing for me amongst the daisies. I even managed to catch him before he went for a dip in his pool. It is a good thing I like the smell of a wet dog. Last week Chance was not feeling like himself. 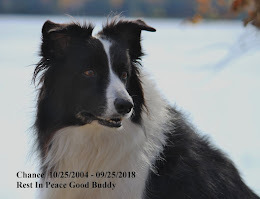 He struggled to get up the stairs one morning, he would be stiff and limpy when I came home from work..he would hobble over to greet me and his normal finicky eating was really finicky..cooked vegetables seemed to be the only thing that would entice him to eat. Far Guy and I discussed it, we both figured that he had some kind of Tick Disease. We called the Vet and she agreed so we picked up 30 days of antibiotics..this time he is on Amoxicillin. This week he is much better..he was much better after being on the antibiotics for a few days. He takes his big old horse pill covered in peanut butter every morning and night. The ticks usually calm down some in July, August and September. We bought some special spray to spray at the edge of the woods that will kill ticks. Far Guy checks Chance many times a day for ticks, and he has Frontline and even an extra dose of Frontline Spray if we notice that he has picked up a few more ticks than normal. I do not know what else we can do. In June of 1953 I was 21 months old. That was 58 years ago. I am not sure what my Aunt Anna and I are exchanging. Aunt Anna is my Dad’s youngest sister, she lives nearby and I see her quite often. She always has a big smile and a hug as a greeting. Aunt Anna and my Dad are the only surviving siblings from their large family of 14 children. Chance: Who Loves Far Guy? It is I, Chance the handsome blogging Border Collie. Miney and Little Elvis came to visit. I introduced them to chipmunk hunting and gave Little Elvis a lesson in chipmunk catching. His eyes were big as saucers…I think the little guy was impressed. We all got to go out on the pontoon on Sunday. I had to share Far Guy all weekend. Miney is a little large for a Sheltie ( don’t tell her I said that..I love Miney) and Little Elvis is on the little side for a Sheltie. What Little Elvis lacks in height..he makes up for with hair. Look at that wild and crazy “do.” Little Elvis are you in there? Little buddy can you see anything? We got out on the water on Sunday afternoon. It was peaceful and calm and I could put my feet up and just take photos. We went over to Two Inlets Lake. The Grand boys love to fish. Noah was catching fish left and right, he must have had four fish before anyone else got a nibble. Andy caught a huge Bass. It caused much excitement! Now they have a landing net and a scale on their wish list. Nothing invigorates little boys/big boys more than a big fish. Adam was trying so hard, he was just feeding the fish, they were stealing his bait. Far Guy showed Miney and Elvis a little Perch that Noah caught. There were birds singing in the trees and a pair of Loons were out in the middle of the lake. They sounded their “Eagle alarm” several times. ( Eagles are predators of Loons.) Sure enough an Eagle was fishing too. It was a cool day, the sun came out for just a little while, the high for the day was about 70 degrees. There were no bugs..it has been too cold for bugs.